ProBasics Steel Drop-Arm Commodes feature a durable steel frame with an easy-release push-button arm mechanism allowing for safe lateral patient transfers to and from the commode. 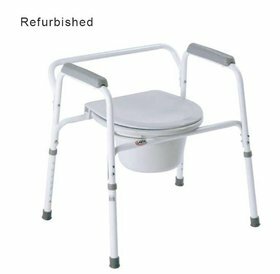 The ProBasics Steel Drop-Arm Commode features a durable steel frame with an easy-release push-button arm mechanism allowing for safe lateral patient transfers to and from the commode. The anti-slip, soft Hypalon® armrests provide extra comfort and support. 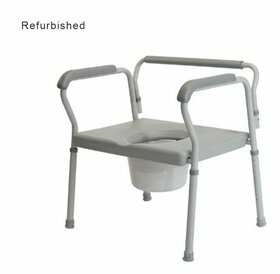 The frame can be configured to be used as a bedside commode, toilet safety frame or raised toilet seat. The tool-free removable back makes configuring the commode easy for any application.